The investigation into Mothman-like flying humanoid sightings around Lake Michigan had its anniversary on April 15th, marking two years since the initial sightings were reported to the Mutual UFO Network (MUFON). 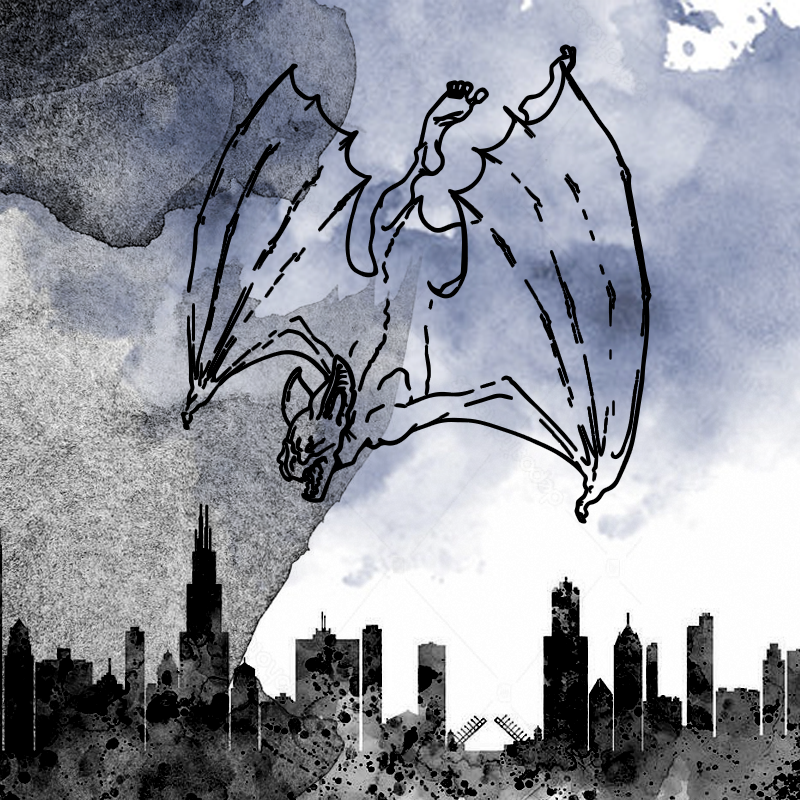 Three separate witnesses reported seeing an unidentified flying humanoid over Chicago between 10 p.m. April 15th and 2 a.m. April 16th, according to MUFON. The first case, numbered 83325, was reported by a woman who was out on Lake Michigan with her husband and two other couples celebrating a friend's birthday. We were about two miles out on the lake, just off of Montrose at about 10 p.m. We were enjoying ourselves when I happen to look up and saw what looked like a giant bat, and not like a fox bat (which I looked up and saw was the biggest bat). This bat was as tall as my husband, who is 6-foot, 4-inches, or even bigger. It was solid black with eyes that seemed to reflect the moonlight. This bat was blacker than the surrounding night sky and was perfectly silhouetted against the moonlit sky. This bat circled the boat three times in complete silence before heading off towards Montrose. It quickly blended into the night sky and was gone in seconds. Weather conditions mostly match the witness’ version of events—the moon was waning gibbous and the sky was partly cloudy—except moonrise that night was at 11:45 p.m.; so either the witness was incorrect about the timing of the event, the detail regarding the reflection of moonlight was embellished, or she mistook a different light source for the moon. The witness went on in her report to describe a bright green object traveling north to south at the horizon that was seen about five minutes after the creature flew off. The second report, Case 83243, took place thirty minutes later, at 10:30 p.m. The witness was said to be "hanging out with [his] boys and a few friends" in Chicago at the time of the sighting. As we talked about work and our families, we heard what sounded like a bird flapping its wings. One of my homies yelled out that he saw a huge Lechuza over by the road. We walked over there and saw what looked like a big owl. As we walked up on it, this owl stood up on two feet and looked right at us. We saw what looked like a huge Lechuza, except it was about six feet tall and really big. It had large glowing red eyes that were completely freaking everybody out. We all yelled and this thing took off into the air and took off toward North Avenue This thing freaked us all out and scared all our kids. In Mexican folklore a Lechuza is an old woman—often a witch, or 'bruja'—who can turn into a giant, black bird. The bird is an owl in most stories, but is sometimes described as an eagle. The third report, Case 83206, occurred at 2 a.m. on April 16, 2017. I arrived for work at 2 a.m. at the Chicago International Produce Market just off Damen and as I walked across the parking lot a bunch of guys (4-5 guys) were staring up at the sky. I looked up and saw the biggest freaking owl I have ever seen! I’m 6-foot, 2-inches, and I’m guessing this thing was at least a foot taller than me. It was completely black except for it having bright yellowish/reddish eyes like a cat. It stood there for a minute or two staring at everyone before shooting up into the sky and disappearing. It made everyone feel very uneasy and only took off after some guys threw some rocks at it. It had wings on it like an owl, only bigger and you could hear it flap those wings when it took off. It made this sound as it took off and flew away that sounded like a truck’s brakes when they are burned out. It flew up and flew a wide circle, making that sound once more and then flew off in the direction of the Stevenson Expressway. We stood around and looked for it for a few minutes, but it never came back. I’m reporting this because there is no way this was an owl. It stood upright like a man, just really, really tall. I don’t want to discuss this with anyone and would prefer to remain anonymous. I don’t imagine anyone would believe me anyways. One of the guys I work with who saw this thing said that it made him feel very uneasy, like a scared kid, and he was glad someone threw a rock and made it fly away. MUFON initially compared the sightings to those of West Virginia's Mothman. Mothman haunted Point Pleasant, West Virginia from November 12th, 1966 to December 15th, 1967 and was known for its large wingspan, glowing red eyes, and the intense fear it provoked in witnesses. At the time, MUFON advised that "Illinois MUFON State Director Sam Maranto and other staff members are investigating. This account is taken merely from the early witness reports filed with MUFON. Please remain skeptical until witness interviews have been conducted and more case evidence is assembled." The result of those investigations are pending release, and it is unknown whether the UFO organization received more reports of flying humanoids in the area. Subsequent reports were largely—possibly exclusively—submitted to UFO Clearinghouse, Phantoms and Monsters, and the Singular Fortean Society. Since 2017, there have been dozens of reported sightings of large, flying creatures within a few hundred mile radius surrounding Lake Michigan, including the Chicago and greater Illinois area, Michigan, Indiana, Missouri, and Wisconsin. These sightings ostensibly began in the spring of 2017, but more historical accounts are being reported as more people become aware of the phenomenon—dating as far back as the late 1960s. They generally take place in the evening or at night, often in or near a park, and around water. Witnesses consistently describe a large, gray or black bat or bird-like creature—although in a small number of cases the creature was described as insect-like—sometimes with glowing or reflective red, yellow, or orange eyes; and humanoid features such as arms and legs are often reported. Many of the sightings are also of something seen only briefly or are described only as a flying creature with few details, which leaves open the possibility that a large bird or bird-like being could explain some encounters.